Hat Tip to Mrs Angry for her excellent blogpost today entitled I Predict a Riot. Police were called to Hendon Town Hall this morning to deal with an ugly mob of unruly, middle-aged trouble makers fighting amongst themselves and threatening to 'form another Tory administration'. 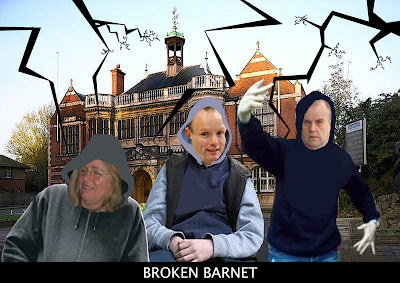 As the troublesome yobs were led away, they defiantly chanted: 'easy, easy, easyBarnet' and vowed to return to the Town Hall on May 6th. I am worried about Brian, though, he seems to have lost weight: have people stopped taking him out to lunch?